Lovelies! The holiday season is finally upon us and if you are like us, you are taking this weekend to decorate your home with all sorts of lovely details! Ever since we were little, my parents always redecorated entire rooms to make way for all of their Christmas decorations. Usually it started with some awesome Christmas chairs that would be center stage of the whole room. 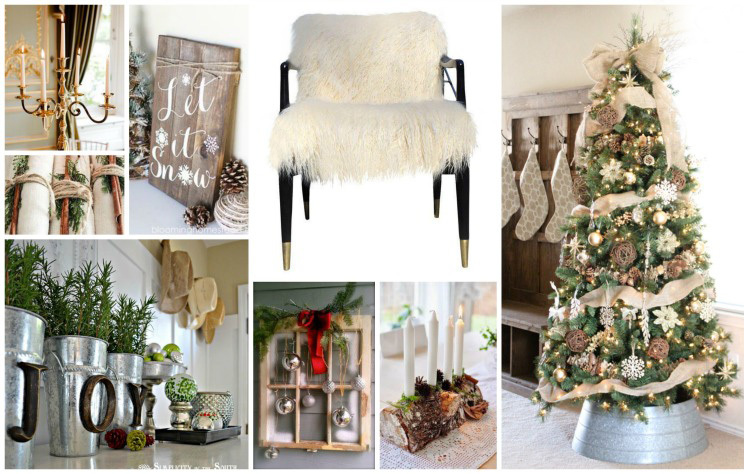 Today, we have teamed with up Chairish to show you an inspiration board that does just that, starts with a lovely chair for Christmas and show you how the whole room can be transformed into a winter wonderland based on just that piece! Our Christmas look year is very rustic, yet cozy. Woods and evergreens are definitely abundant in the details as is natural wood. Galvanized steel is also very abundant as is silvers, whites and golds.We thought this white fur accent chair was the perfect piece for this look and really ties in the entire look and color palette. They have tons more though to fit your fancy! This look is very natural, earthly and cozy, with touches of luxury too. All things we love! We are adoring this Rustic Christmas inspiration board and we hope you do too! Christmas Countdown Day 9: Evergreen Branches! Christmas Countdown Day 2: Christmas Mantels Christmas Countdown Day 15: Christmas Centerpieces Fiesta Inspiration Board!